This succulent bonsai, also known as the "Elephant Bush", is native to South Africa and has pale green leaves that are almost round and about one-third the size of the common Jade plant. The fleshy trunk, branches, and leaves are used to store water. 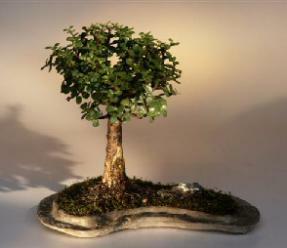 An excellent beginner bonsai for home or office. 8 years old, 13"-16" tall. Planted in a 15" x 8 x 1" glass fiber reinforced concrete rock slab.